During the late 1960’s to mid 1970’s in England I was very much influenced by the alternative cultures prevalent at the time and became interested in understanding more about traditional Japanese and oriental culture, philosophy and religion as a way to appreciate life and the metaphysical. At the same time in Britain we were seeing evidence of the advances in the industrial technology of Japan through the growing imports of consumer goods. I visited the Shizuoka Prefecture in March 2008. This was my first visit to Japan and my first trip to Asia. Having toured around an extensive area I decided to concentrate on the industrial and urban areas within the Shizuoka Prefecture. What was striking to me was the Westernisation of the built environment and how the ordered and very structured way of life in Japan is reflected in the landscape. 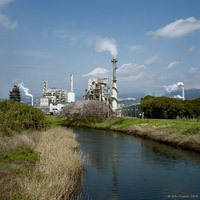 I was particularly interested by Fuji City as one of the most concentrated industrial urbanised areas I have seen. The spectacle of Mount Fuji is impressive and, when clouds lift, its presence dominates the city and surrounding landscape. It is no wonder that Mount Fuji has become the national symbol of Japan and a significant symbol of the forces of nature on these volcanic islands. Maybe we have seen too many images of this old volcano and over familiarisation can create a cliché where significance is lost. However, I decided to make an additional set of work centered on Mount Fuji, with its ever-changing weather systems, as a backdrop to the industrial and urban reality of the modern Japanese landscape. My interest in visualising the landscape comes from a desire to understand how the world I occupy is shaped. For 27 years I have engaged in an exploration of the industrial and urban western landscape – as an independent observer to the changes in the built environment. I am interested in the historic, industrial and social layers that can be revealed in the landscape. A landscape shaped by forces that are evident in the remnants and marks of former uses and the impact of people on their environment. I attempt to communicate my findings and conclusions visibly through documentary photographs. I am not really interested in describing what you can see in my images but rather prefer to write about the things that can’t be seen.